Making a difference at Kettering Station has been an ongoing project that began with the offer of the use of a room for community use at the end of 2015. 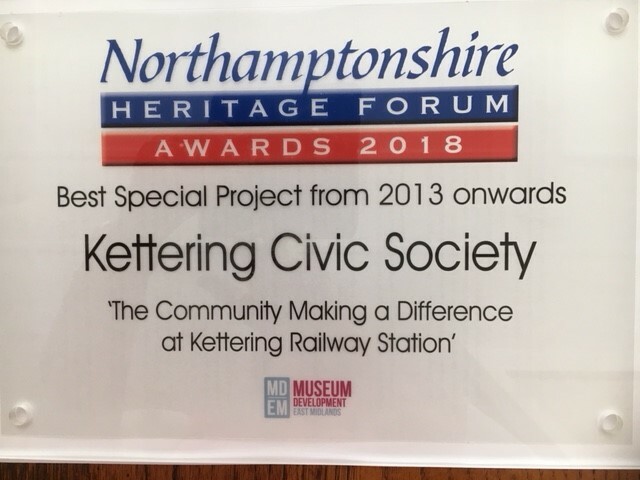 Kettering Civic Society has a special interest in Kettering station dating back to 1978 when it successfully campaigned to save the ironwork and canopies above the platforms. There are unused rooms at the station which are mostly derelict and the general fabric of the station is in need of restoration. Working with East Midlands Trains, it is the aim of the Society to see that the fabric of this Grade 2 listed station is sympathetically restored, that the rooms be used either for commercial or community benefit and that the environment around the station provides a welcome to commuters and visitors, thus encouraging tourism to the area. 1. Time Travellers was decorated by volunteers from the Civic Society, East Midlands Trains and Network Rail. 2. A garden and planting at the station was created. The Society included the following volunteers by: • engaging a Prince’s Trust Team to design and create a garden on a piece of derelict land at the entrance to platform 1 and the car park, • approached Kettering Borough Council and a variety of businesses who sponsored the planting, • invited Rotary to join the Civic Society’s Station Adopters in continuing to tend the plants when Prince’s Trust Team had completed their project, • with Civic Society members. • Civic Society meetings regularly take place, • U3A holds a monthly French class, • the room is used for Mindfulness sessions, • art exhibitions during Northamptonshire’s Open Studios, • craft workshop, • Civic Society exhibitions. • Time Travellers is open when steam trains come to the station and this is always very well attended by hundreds. The society has merchandise for sale and promotes activities and events in the area. • The Society organised blue plaque celebrations in 2017 to mark the opening of the station 160 years ago together with the unveiling of a plaque for H.E. Bates. Following on from the station celebrations a talk was given “When the Railway Came to Kettering” hosted by The Friends of the Alfred East Art Gallery. • A special train/station themed art and photographic exhibition continued from May 2017 throughout year. • The Society has a blue plaque trail around the town and we joined in with KETTFEST, creating a trail through the town and ending with the two plaques at the station. Volunteers and all those who have participated and continue to participate have thoroughly enjoyed playing a part in the activities that have been connected with Time Travellers. Opportunities have arisen for the meeting of old friends and making new ones throughout the time that Time Travellers has been open. The coincidences, exchange of memories and stories that have resulted from exhibitions have been amazing and most rewarding in more ways that one. When the 2017 train themed exhibition opened no one could predict the interest shown in a particular painting that went on to be made into prints raising £580 for charity! The station continues to be welcoming with the continued care of the planting. Good relations have been forged with all those who participate in this project. Kettering Civic Society committee members have been instrumental in delivering the project with the secretary acting as main co-ordinator. This project was and continues to be a true community effort and it is difficult to estimate the number of those who sponsored, volunteered, enjoyed participating in events, commuters and visitors to the station but numbers must exceed 300. When the Society was first given the use of the room a budget was not considered, it was a project that grew like Topsy. The decoration of the room was funded by the Society and cost £1,056 this included 5 information boards. Donations of furniture were made. The Prince’s Trust Team raised funds toward the garden and flower trolley, Kettering Borough Council donated plants as did Bosworth’s Garden Centre. The Society pays for projects through fundraising events. 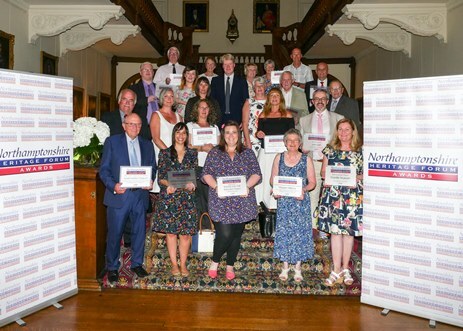 Projects that have taken place since the beginning have all been successful and completed on time to a high standard with thanks to the hard work of dedicated volunteers. The acquisition of a room at Kettering station has given the Society a new dimension and an opportunity to showcase its work, engage the community, enhance the station and promote the area to attract tourism.